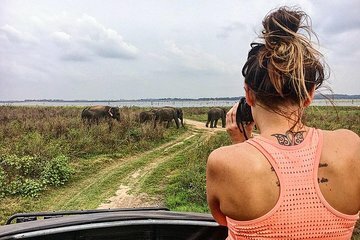 Witness the natural beauty of Sri Lanka with this full-day tour to Minneriya National Park from Negombo. Get picked up at your hotel and travel by air-conditioned transport to the park. Set out in a Jeep to see herds of wild elephants in their natural environment. Keep an eye out for other animals that live in the park including many species of birds, buffalo, deer, leopards, and more.